How Do I Clean My Aligning Trays? The best way to clean your aligning trays is with warm water and antibacterial clear soap. Because you can take your trays in and out when eating, it’s important to clean them, especially if there is visible debris. Do not use toothpaste on your aligners. Although it may seem like a good idea, toothpaste will scratch your aligning trays creating a place for bacteria to live. 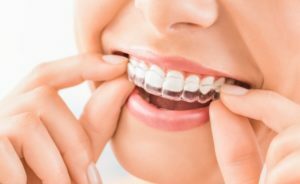 How Long Do I Wear My Aligners? You must wear your Invisalign aligners for at least 22 hours a day. Failure to do so will mean a longer treatment process and less positive results. Additionally, change your trays as instructed by your dentist. Changing your trays on your own with out your dentist’s go ahead can throw off the treatment process and even lengthen it. What Should I Eat and Drink with Them? One of the best benefits of Invisalign treatment is that you can take your aligning trays out when you eat or drink, so you won’t have to worry about what you can and can’t eat like with braces. Water should be the only thing you consume while your aligners are in place. Drinking a lot of water is healthy for your body, but it can also help wash away any debris on your aligning trays. Additionally, any food rich in calcium or protein are good to eat during Invisalign treatment to promote enamel health. Should I Change My Regular Oral Healthcare Routine? Your oral healthcare routine is more important than ever during treatment. Brush twice a day and make sure you floss every day. The aligners can hold any gunk or bacteria that’s left over right up against and in between your teeth, making flossing more important than ever. So, are you ready to get the most out of your Invisalign treatment? Follow our helpful tips to get yourself (and your teeth) better adjusted to your aligning trays. Dr. Hirshfield has been offering Invisalign aligners to his patients for over 11 years and he is one of Invisalign’s Preferred Providers. This means he has used Invisalign aligners successfully on many patients to straighten their teeth. He currently runs his own practice and can be contacted by phone at (508) 359-8822.